Um, boss, I’m pretty sure the Afghan Ambassador here is from Afghanistan. (SPOILERS) How many War on Terror movies have to be made – let alone War on Terror satires – before Hollywood realises it simply doesn’t have what it takes to interrogate the ongoing charade with any degree of acumen, diligence or (in this case) wit. This isn’t just true of that particular ongoing excursion into imperialism, of course, it’s largely the case with any would-be politically-attuned vehicles (see the recent Our Brand Is Crisis), that go for soft ineffectuality, or knowing aloofness, when something, anything would be preferable. Anger’s one mode. Insight’s even better. 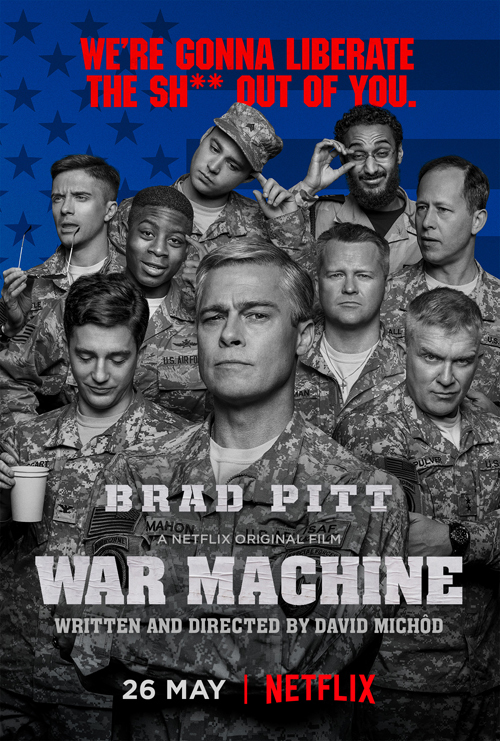 They’re both absent from War Machine, a fictionalised account the attempts by General Stanley McChrystal (here as Brad Pitt’s Glen McMahon) to preside over a turnaround in the US armed forces fortunes in Afghanistan despite the realisation he’s been sent in to oversee a withdrawal. The result is unfocussed and rambling, unsure who its targets are or even if it holds a position. Other than being above it all. Pitt’s cartoonish performance, all exaggerated posturing and delivery, has come in for a lot of stick, but that’s only fair in as much as he’s acting in a different, more interesting movie than the one David Michôd is making (which Michôd also wrote, based on Michael Hastings’ The Operators). Pitt’s movie, as bold, brazen and as uncompromisingly unsubtle as its main character, might have fired salvos at all comers, sharing out versions of the same dumb rhetoric McMahon spouts to parties concerned while reserving particular ire for the whys and wherefores of the conflict itself, which go unmentioned (other than some vague headshaking). As it is, we’re presented with McMahon as a “master of systems organisations” who refuses to accept that he hasn’t been sent to Afghanistan to win, who chides “Seems to me everyone’s forgetting we’re fighting a war here” and has designs on bringing the most difficult region to heel as a signal of his greater intent. Faced with POTUS’ refusal to provide extra troops and delays on everything he intends to institute (told he will have to wait while local elections are re-held owing to corruption, he dismisses such concerns with “How is Washington any different?”), he goes on 60 Minutes and creates a political embarrassment for Obama. There’s a certain Catch-22 logic operating here that Pitt probably thought he could tap (and since he’d had previous success working with Antipodean Andrew Dominik, he probably thought Michôd’s outsider view would be equally incisive), but the picture only rarely approaches such areas in an engaged or astute manner. President Karzai: And what is this new direction? McMahon: It is most important to me that we build Afghanistan. Together we build Afghanistan into a free and prosperous nation. Free from fear and conflict. President Karzai: I see, I see. It sounds a lot like the old direction. His audience with Ben Kingsley’s West-sanctioned President Karzai, in which he preaches the new direction for the country, has the right air of flippancy towards what the military think they’re doing, but a whole spiel on counter insurgency is subsequently delivered as a dry voiceover monologue from Scoot McNairy’s (Rolling Stone) journalist Sean Cullen; “The thing about counterinsurgency is that it doesn’t really work”. He posits that McMahon’s response to this would be “Cos nobody’s ever done it right”. This is fertile ground, that insurgents are near impossible to defeat, but countermoves are equally ineffective, requiring you to convince the population you’re there here to help, making you part of a popularity contest, along the way installing a local government, providing security, training up the local forces so they can provide security to help themselves (or at least try to) and stimulating the local economy, but it’s too impassive to have any edge or impact. There’s a scene where McMahon asks why growers are producing heroin crops, and he is told they can’t produce cotton because it would be in competition with US product. Michôd gets close to the resource plundering that is the key to Afghanistan, but then loses his nerve and retreats to the safer ground of surface, easily mockable military farce. Hence, McMahon is rebuked with “All the winning we were ever going to do, we did in the first six months. Since then, we’ve just been making a mess. You’re not here to win. You’re here to clean up the mess”. The idea that Afghanistan is simply a disaster is a convenient narrative hiding ulterior goals, though; make the entire operation look like a botch, and it becomes more palatable. Simply a mistake. Whether Pitt is aware he has served such an agenda is debatable; probably not, but then few will likely care either way. I doubt many with the opportunity to sit through a “free” Brad Pitt movie on Netflix are going to last the distance; By the Sea has more attitude. At one point, Tilda Swinton cameos as a German politician spelling out what we’ve already had spelled out several times already by our narrator and in various conversations; it’s overkill. The incessant narration is a fairly substantial signpost that something is seriously wrong. I love a good voiceover, but this one is entirely guiding the plot as a substitute for storytelling. When we need to be told who the central character is over the course of five, there’s something askew. The flipside is that a similar approach actually worked for The Big Short (from the same producers). Of course, there they knew what their goal was. Part of the problem is that Michôd isn’t a satirist, certainly on this evidence, and it’s telling that the one scene that lands feels like it has strayed in from a different movie. Which is also a different movie to the different movie Pitt thinks he’s in. Maybe Michôd simply felt it wouldn’t be a War on Terror picture without a scene of conflict. Maybe he thought a scene of actual combat would provide something sobering, akin to Yossarian’s traumatic memory in Catch-22. So the scene in which Lakeith Stanfield’s corporal, taking matters into his own hands when his squad comes under fire, discovers his mortar bomb has been responsible for killing a child is strong stuff, but tonally out of place. More on target is McMahon appearing on the scene and blathering on to the grieving father about helping to rebuild; Stanfield’s earlier quizzing of the bewildered general about his nonsense rhetoric is also well done, albeit in both cases we shouldn’t need to be walked by the hand with this sort of thing. It reflects the essential lack of faith in the audience throughout. There are some very good performances in War Machine. Anthony Michael Hall’s a particular standout as McMahon’s devoted, hot-headed right-hand man Major General Pulver (loosely based on Mike Flynn). Nicholas Jones, Alan Ruck and Griffin Dunne are strong as obstructive bureaucrats, and Meg Tilly is excellent as McMahon’s church mouse wife. And the Russell Crowe cameo (as, essentially, David Petraeus) as the next guy up to replace McMahon, is an amusing send-off. But they’re a good cast mostly wasted. Cullen concludes by asking why the media didn’t ask bigger questions regarding McMahon’s removal, but damningly, you could say exactly the same of the movie. What’s the surprise here? That the US military’s methods are incompetent? That’s not news, and it isn’t terribly rousingly interesting the way Michôd has told it. Perhaps Hollywood would be better off sticking with straightforward firefights (American Sniper, 13 Hours, the forthcoming Bruckheimer-produced Horse Soldiers), rather than making a pretence of critiques. This is the water, and this is the well. Sometimes the more you look, the less you see. The head is missing... and... he's the wrong age. It's not an exact science, this business. Out here, I'm only responsible for the light. I have a problem with my liver. She's a very good secretary. No, I don’t think I’ll call Mr Strawberry. What a truly revolting sight.